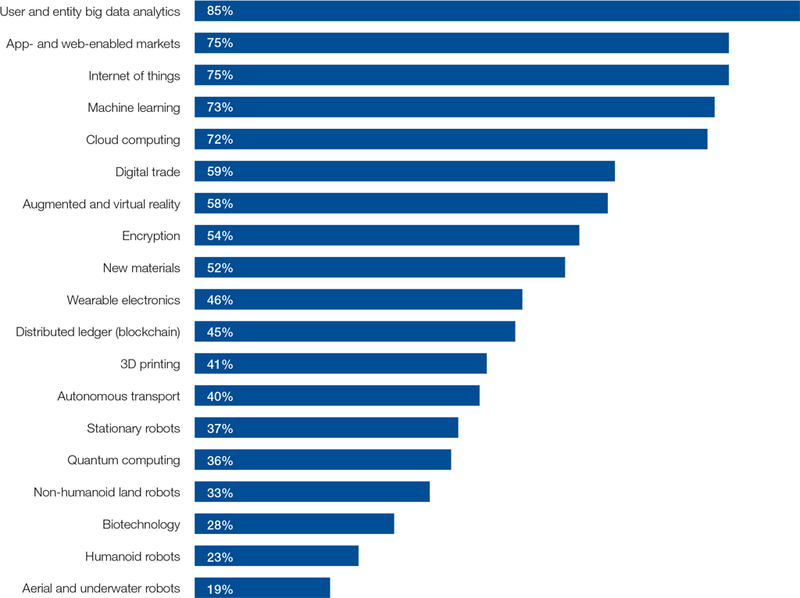 As the Fourth Industrial Revolution unfolds, companies are seeking to harness new and emerging technologies to reach higher levels of efficiency of production and consumption, expand into new markets, and compete on new products for a global consumer base composed increasingly of digital natives. More and more, employers are therefore also seeking workers with new skills from further afield to retain a competitive edge for their enterprises and expand their workforce productivity. Some workers are experiencing rapidly expanding opportunities in a variety of new and emerging job roles, while others are experiencing a rapidly declining outlook in a range of job roles traditionally considered ‘safe bets’ and gateways to a lifetime career. According to the global employers surveyed for this report, four specific technological advances—ubiquitous high-speed mobile internet; artificial intelligence; widespread adoption of big data analytics; and cloud technology—are set to dominate the 2018–2022 period as drivers positively affecting business growth (Table 2). They are flanked by a range of socio-economic trends driving business opportunities in tandem with the spread of new technologies, such as national economic growth trajectories; expansion of education and the middle classes, in particular in developing economies; and the move towards a greener global economy through advances in new energy technologies. By contrast, technological and social trends expected to negatively impact business growth include increasing protectionism; cyber threats; shifts in government policies; the effects of climate change; and increasingly ageing societies. Opportunities for new and emerging technologies to drive inclusive economic and business growth over the 2018–2022 period are manifold, yet concrete and viable mechanisms for preparing the global labour market—thereby enabling employers to better leverage these opportunities across industries and regions—remain elusive. A mindset of agile learning on the part of both company leaders and workers will be needed, starting with an ability to reimagine the routines and limits of today’s jobs as part of a comprehensive workforce strategy for the Fourth Industrial Revolution. 4 Bain & Company, Labor 2030: The Collision of Demographics, Automation and Inequality, 2018. 5 According to an estimate by Bain & Company, based primarily on the rapidly declining cost of robotic dexterity for service applications, humanoid robots are likely to reach commercialization in the early 2020s, specifically creating ‘a strong business case for the automation of many tasks in restaurant kitchens and bars’; see: Bain & Company, Labor 2030: The Collision of Demographics, Automation and Inequality. 6 For example, ‘cobots’—robotic helper units installed alongside human workers to enhance their productivity and often costing less than one-quarter the price of traditional robots—are set to have a large commercial and workforce impact over the coming years, being well-placed for deployment in many parts of the service sector as yet largely untouched by workplace automation; see: Bain & Company, Labor 2030: The Collision of Demographics, Automation and Inequality.